Centrally located in Playa Blanca with shops, bars and restaurants being within walking distance, Villa Iko is the perfect choice if you don't want to hire a car! The sandy beach also can be reached on foot. The villa is spacious inside and out and is a great, relaxing Spanish retreat . What's not to love? Air conditioning/heating in all bedrooms and the lounge, a heated pool and WiFi are included. There is also a removable pool fence on request at an extra cost. The fantastic location - Just a short stroll from supermarkets, bars, shops, restaurants and the beach! 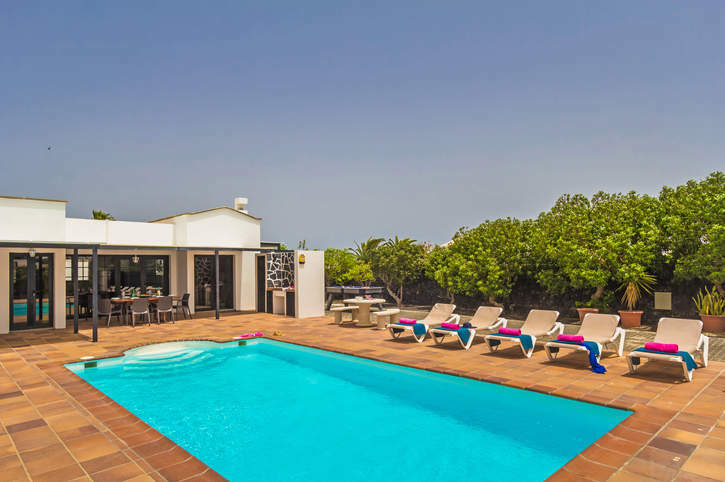 The outside area is great for soaking up the Canarian sunshine and enjoying a splash in your own private pool, which has Roman steps for easy access. There is also a pergola under which you will find patio furniture providing a welcome break from the sun. To the side of the house is a circular stone table in front of the BBQ area adding an extra place to enjoy dining alfresco. Through the garden gate and a few steps further will bring you to the entrance of the villa, which welcomes you directly into the lounge area. There is plenty of space to park your car on the street. The lounge creates the impression of a home rather than a holiday villa with its darker coloured tiles and contrasting décor. There's comfortable sofas in front of the large patio windows to enjoy a pool view and a separate dining area with a wooden table and chairs. The kitchen is compact but has all the modern appliances. There are 2 double bedrooms and 1 twin bedroom in the villa. All bedrooms have fitted wardrobes, plus one of the double bedrooms has a patio door to the pool terrace. There are also 2 shower rooms. This semi-detached villa is a short walk from the bars, shops, restaurants and supermarkets of Playa Blanca as well as the beach. The fashionable Rubicon Marina is famous for its designer shops and restaurants facing the yachts and is only a short taxi or car drive away. The villa is located next door to our Villa Yeray and is great for families or groups who wish to holiday together but to retain their own privacy. There is a market held every Wednesday and Saturday at Rubicon Marina. Here you will find about 30 stalls with crafts, jewellery, arts and books. There is also the big Sunday market at Teguise. A selection of shops is a short walk away from the villa. For those who enjoy wandering around the shops there is plenty of choice as well from shoe boutiques, high street fashion, sports, goods and gift shops. All this is fringed by white sandy coves lapped by crystal clear waters that hug the coastline. A good choice of bars and cafes, mingled with restaurants of every calibre from charming taverns typical of the island, to Chinese, grills and Italian can be found within walking distance from the villa. The Playa Blanca Beach is within walking distance from the villa. The beaches including the Playa Dorada, which is a white sandy beach, can be found behind the Princesa Yaiza Hotel and has all the popular facilities of a tourist beach with sun beds, parasols and jet skis for hire and a refreshment kiosk. The Playa Flamingo is an ideal family beach overlooked by a selection of cafes and restaurants with shallow clear waters. Playa Blanca is very popular with anyone wanting to try something more active and hiring bicycles is easy and a popular way of exploring the local area. From the Playa Blanca Harbour, you can take a ferry to the neighbouring island of Fuerteventura, which is great for a family day out. Or book a catamaran or fishing trip here. A coastal walkway, ideal for strolling, takes you past the Rubicon Marina where you can watch great sunsets. The National Park of Timanfaya is probably the most famous place in Lanzarote. Take the journey through the Luna route passing some of the largest craters and the valley of tranquillity to fully appreciate the natural energy that has shaped the island. Here you can see demonstrations of the tremendous heat that still lies below the surface. Lanzarote is an ideal destination for golfing holidays all year round. A pitch and putt course is located in the Hesperia Hotel in Playa Blanca. There is an 18-hole golf course located behind Puerto del Carmen. A more established course is also available in Costa Teguise located on the east coast. Villa Iko is not available to book for season as it is sold out. Take a look here at the Lanzarote villas that are currently on sale. Rubicon is an area of Playa Blanca that consists of the exclusive Rubicon Marina, which is set in a tranquil atmosphere with an assortment of bars and restaurants on terraces overlooking the yachts and boats moored there. Amusements and a bowling alley are located just at the entrance in the commercial centre that also plays host to a weekly market. Villa Iko is in an excellent private position, a short easy walk to the amenities of Playa Blanca old town. We chose it because of its location and the availability of a pool fence and it met these criteria. The pool was warm and well maintained, the villa was as described and very private and had good space. This was our third holiday with Villa Plus and in general, we were very satisfied with our holiday. Although we did not specifically require help from the Reps, the reception at the airport and the visit by a Rep to the villa were excellent. We will be back! Villa is in a good location - easy 5 minute walk to centre for shops, restaurants, beach etc. Outside area is not overlooked and we enjoyed the pool and games area. The the villa facilities were clean, comfortable and adequate. A good villa in a great location. Ideal location, being only 5-10min walk to the shops, bars and beach. The villa is in a quiet location, is clean and with good entertainment (pool, pool table, DVD player and table tennis). We thoroughly enjoyed our week - the pool was warm, great location (very central, yet tranquil), a lovely light living room, spacious outdoor area and better than average sunbeds. We are likely to book with Villa Plus again. Villa was clean and tidy, pool area was first class. We enjoyed our holiday very much and would book again. Villa Iko was a lovely villa and had all we needed for our holiday. We very much enjoyed our time at the villa and we would go on a Villa Plus holiday again. Thank you for a great holiday, very relaxing for the whole family. Very spacious and clean. Had lots of little extra's that made it feel very comfortable. It felt more like a home than a basic Holiday Villa. Great location - near to all amenities and beach. The outside space was great. A large pool that was clean and warm. Plenty of space for the children to play. The outside BBQ was a real bonus. Overall we had a relaxing, comforable holiday. The Villa was well maintained and in a quite location.